Eugène Delacroix (1798–1863), Clorinda Rescues Olindo and Sophronia (1856), oil on canvas, 101 x 82 cm, Neue Pinakothek, Munich, Germany. Wikimedia Commons. 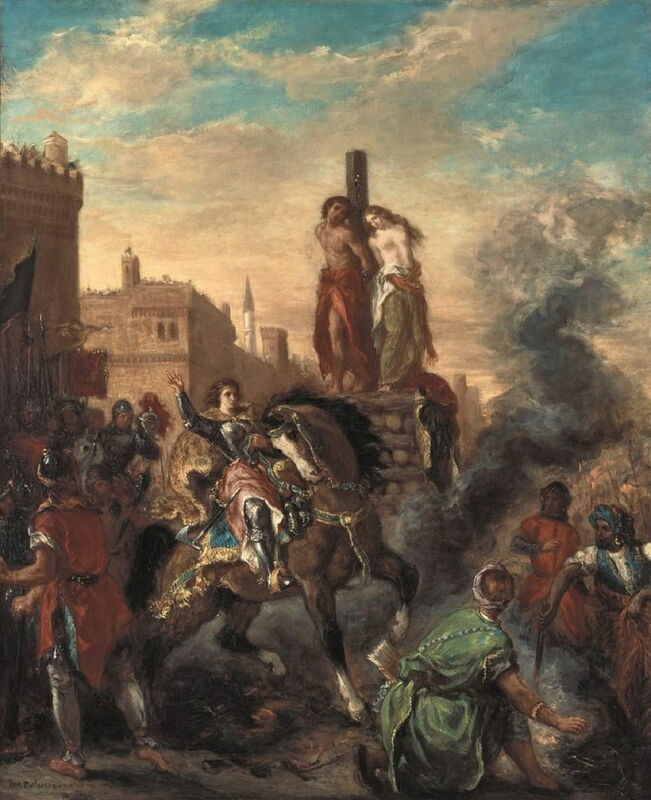 Torquato Tasso opens the first Canto of Jerusalem Delivered with a fairly conventional dedication to the muse, and homage to his patron, Alfonso II of Este. His narrative starts by setting events six years after the Pope’s call to crusade (actually in late 1095), and briefly mentions the capture of Nicaea and Antioch, to set the opening scene in the following winter (1098-99), with the crusaders in their quarters at ‘Tortosa’. That is now known as Tartus in Syria, a port on the Mediterranean coast well to the south of Antioch. Rinaldo, the courageous and restless warrior. Merry-Joseph Blondel (1781–1853), Tancred of Hauteville, Prince of Galilee (1840), oil on canvas, 167 x 78 cm, Château de Versailles, Versailles, France. Wikimedia Commons. Three of these figures are well-known, and appear in various paintings, but Tasso reinvents those of Tancred and Rinaldo, the heroes of his epic. Merry-Joseph Blondel’s painting of Tancred of Hauteville, Prince of Galilee from 1840 shows Tancred rather later during the Crusade, looking suitably grand. God therefore sends down the Archangel Gabriel to spur Godfrey to lead the Crusaders onwards to free Jerusalem, which the archangel does just as Godfrey is at his morning prayers. Johann Friedrich Overbeck (1789-1869), The Archangel Gabriel Appears to Godfrey of Bouillon (1819-27), fresco, dimensions not known, Casa Massimo, Rome, Italy. Image by Sailko, via Wikimedia Commons. 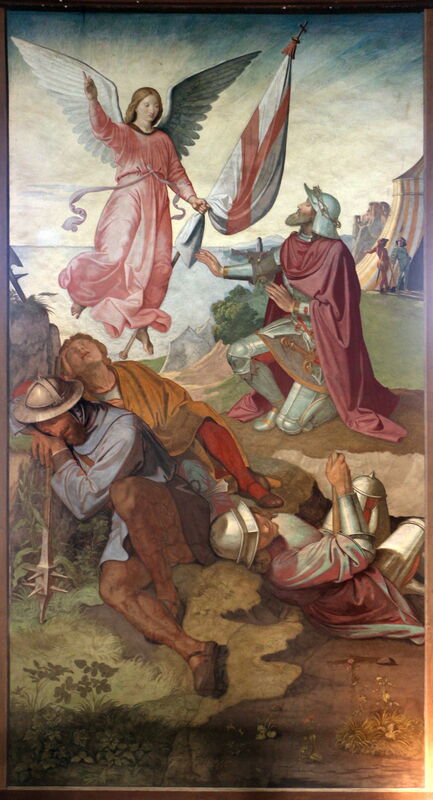 In this section of Johann Friedrich Overbeck’s magnificent frescoes in the Casa Massimo, in Rome, The Archangel Gabriel Appears to Godfrey of Bouillon. His companions are still asleep as Gabriel speaks to Godfrey, clutching what most would now recognise as a flag of the Cross of Saint George, in red on a white background. Francesco Guardi (1712–1793), Godfrey of Boulogne Summons His Chiefs to Council (c 1755), oil on canvas, 250.2 x 109.9 cm, Norton Simon Museum, Pasadena, CA. Wikimedia Commons. Francesco Guardi shows a slightly later moment, as the archangel flies away from the scene, and Godfrey of Boulogne Summons His Chiefs to Council (c 1755). All the leaders except Bohemond attend this meeting, at which Godfrey reminds them of their primary mission, to deliver the Holy City of Jerusalem, and the need to make haste towards it. Peter the Hermit then speaks in support, castigating the individual leaders for their in-fighting and rivalry. The leaders agree to Godfrey being in command overall. Italians, under Camillus, seven thousand. Tasso gives a grand total of around thirty-five thousand, which is probably more than double the number of surviving crusaders at this stage. In his remarks about Tancred, Tasso tells the story of him falling in love at first sight with a young girl clad in armour, during a battle in which Persians were put to flight. Tancred had gone to a brook to cool off afterwards, when this ‘pagan’ arrived for the same purpose. She then left, donning her helmet, without Tasso even revealing her name at this stage. The army’s departure is made the more urgent as Godfrey has heard that the ruler of Egypt is on his way, with his army, to his fortress at Gaza, which could be used to attack the crusaders as they near Jerusalem. Godfrey then sends his trusty messenger by boat to Greece, to obtain reinforcements which had been promised by the king. The next day they depart to the sound of trumpets and drums. Godfrey sends lightly-armoured knights to scout in advance and ensure that the main army isn’t ambushed, and field engineers to ensure that their route of march is free of obstacles. The crusaders meet little opposition as they make their way south: even the King of Tripoli capitulates and welcomes them into his well-defended city. As they march down the coast, they receive ships with provisions from several of their supporting countries. Word of their progress reaches Aladine, the ruler of Jerusalem, who, being newly in charge of the city, already has other concerns. He had already raised taxes on the Christian minority in Jerusalem, and harbours ideas of killing them all. He doesn’t attempt that, but burns their harvest, demolishes their huts, and poisons their wells, while strengthening the fortifications of the city. The second Canto starts with Aladine in Jerusalem. A former Christian soothsayer, Ismen, warns the ruler to prepare for the arrival of the crusaders, but predicts that Aladine will be triumphant. Ismen then asks for a sacred icon of the Virgin Mary to be secretly stolen and hidden away to protect the ruler. Aladine has this done, but the theft is noticed by a guard, who reports it to the ruler. The latter then claims that it must have been stolen by a Christian, and has the city searched. He decrees that the thief will die, but if no thief is found, it provides him with an excuse for killing all the Christians. He incites a mob, calling for them to “burn and kill”. A young Christian woman named Sophronia, who is in love with the Christian Olindo, then comes forward and tells Aladine that it was she, and she alone, who stole the icon. When the ruler asks her where it is hidden she responds that she burned it. 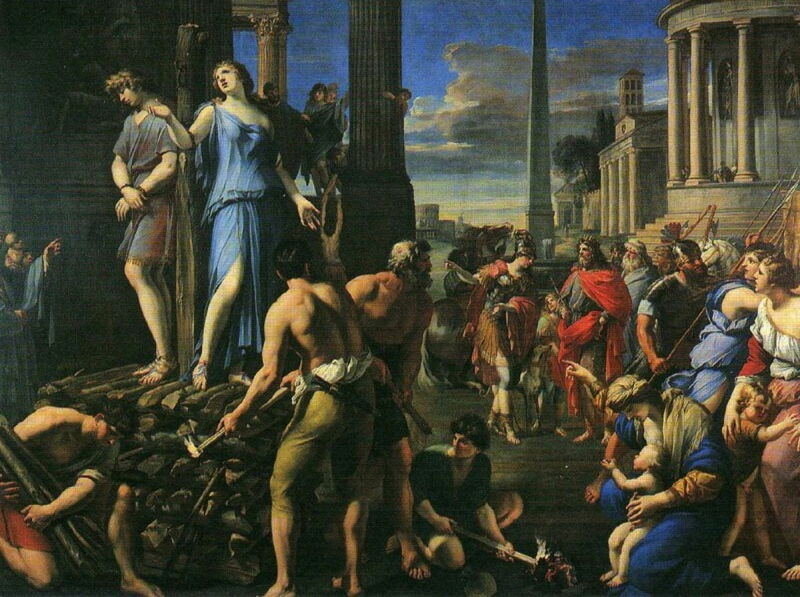 Sophronia is condemned to death by being burned at the stake. As the crowds are gathering to watch her die, Olindo arrives, and insists that she is not the thief. Although he gives Aladine an account of how he accomplished this, the ruler of course knows that neither did. But he cannot back down, and sentences Olindo to die at the same stake, tied with his back to his love, so that they cannot see one another. Lubin Baugin (1612–1663), Olindo and Sophronia on the Pyre (c 1645), oil on canvas, 157.5 × 111.8 cm, location not known. Wikimedia Commons. Lubin Baugin’s dramatically simple painting from about 1645 shows Olindo and Sophronia on the Pyre. Just as Aladine’s men are about to light the kindling and kill the Christian couple, who are making their farewell speeches, a warrior rides up. This is Clorinda, a beautiful young woman, who is moved by the sight of the two lovers about to die together. When a bystander explains what is happening, she instructs the executioners to stop their preparations as she speaks to Aladine. Clorinda introduces herself to Aladine, and offers him her services. In return, she asks that he frees Sophronia and Olindo, on the grounds that no Christian would have stolen such a holy icon. This has proved a popular scene with a succession of artists, from shortly after the publication of Tasso’s epic, up to the middle of the nineteenth century. 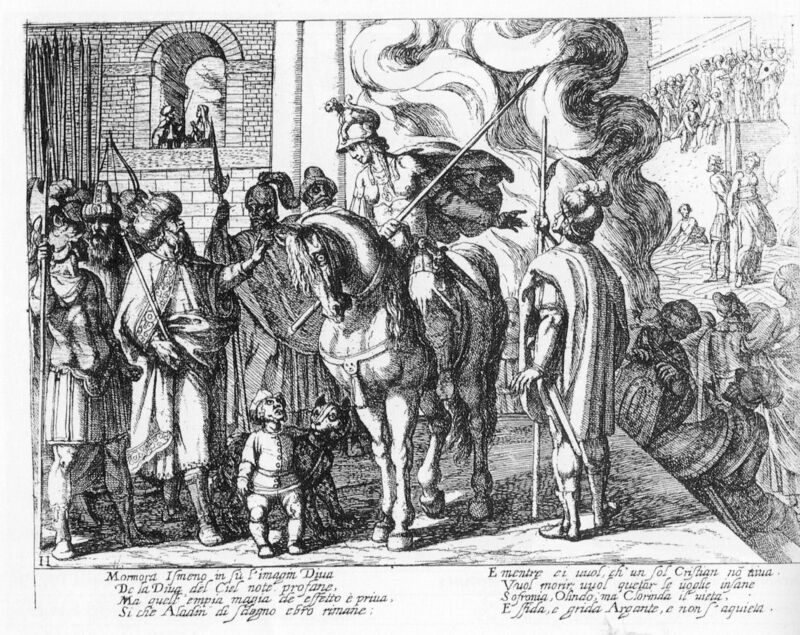 Antonio Tempesta (1555–1630), illustration from Tasso’s ‘Gerusalemme Liberata’ (c 1597), engraving, further details not known. Wikimedia Commons. Antonio Tempesta’s engraved illustration from about 1597 puts Clorinda in the centre foreground, as she talks to Aladine at the left. The couple are shown at a stake to the far right, in the background. François Perrier (1594–1649), Olindo and Sophronia (c 1639), media and dimensions not known, Musée des beaux-arts de Reims, Reims, France. Wikimedia Commons. François Perrier’s Olindo and Sophronia from about 1639 reverses this, with Clorinda and Aladine in the distance at the right, and the young couple standing as their executioners prepare the pile of wood for burning. Mattia Preti (1613–1699), Clorinda rescues Olindo and Sophronia (1646), media not known, 248 x 245 cm, Musei di Strada Nuova, Genoa, Italy. Wikimedia Commons. Mattia Preti brings them all together in Clorinda Rescues Olindo and Sophronia from 1646, with a man stood behind Aladine bearing a burning brand. In the sky is a Cupid, and Sophronia is almost unclad. Cornelius van Poelenburgh (1594/95–1667), Clorinda Saving Olindo and Sophronia from the Stake (date not known), further details not known. Wikimedia Commons. 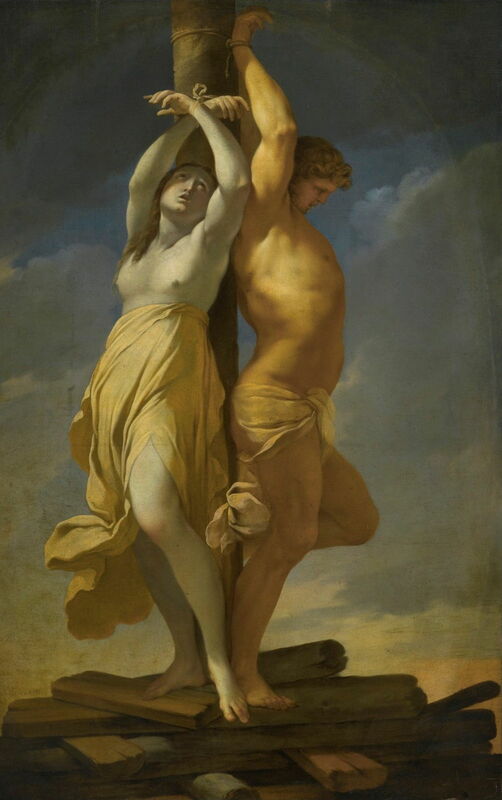 Cornelius van Poelenburgh’s undated Clorinda Saving Olindo and Sophronia from the Stake is less clearly structured, and more expansive. 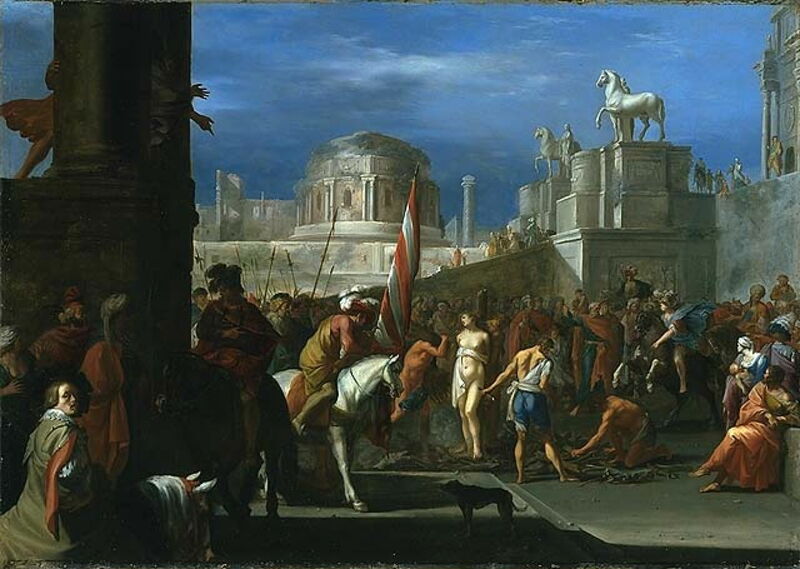 Clorinda is on her horse at the right, and a naked Sophronia stands at the stake in the centre. Aladine isn’t clearly distinguished, though. 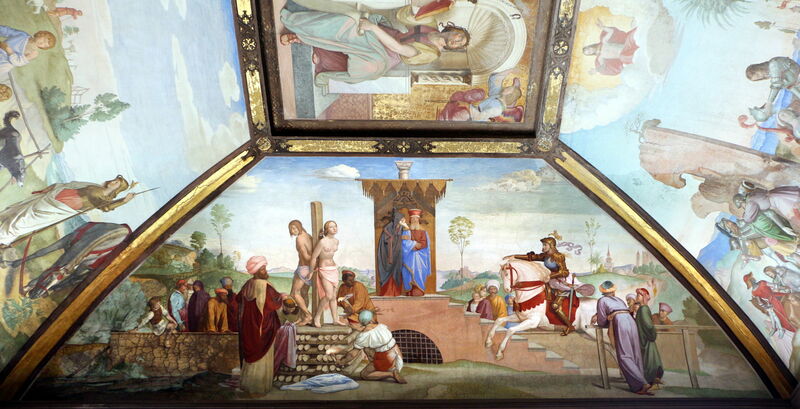 Johann Friedrich Overbeck (1789-1869), Sophronia and Olindo Saved by Clorinda (1819-27), fresco, dimensions not known, Casa Massimo, Rome, Italy. Image by Sailko, via Wikimedia Commons. Although painted almost two centuries later, Overbeck’s fresco of Sophronia and Olindo Saved by Clorinda (1819-27) is much less cluttered, and far easier to read. Unusually, Clorinda is shown riding a white steed, and with golden rather than black armour. Eugène Delacroix’s Clorinda Rescues Olindo and Sophronia from 1856 is a minor masterpiece. Clorinda has just arrived, wearing her more conventional black armour, as one of the enemies of the crusaders, and holds up her right hand to tell the executioners to stay as they are. The stake is raised high, putting the couple in full view, although Aladine is nowhere to be seen. Aladine cannot refuse Clorinda, nor refute her reasoning, so decrees that the couple be freed. However, he imposes the condition that they are banished from Jerusalem, and must live outside Palestine. Whilst he is about it, he banishes all the other able-bodied Christians, who could pose a threat when the crusaders arrive. They mostly find their way to the town of Emmaus, where the crusaders have just arrived. Posted in General, Life, Painting and tagged Baugin, Blondel, Crusade, Delacroix, Guardi, history, Jerusalem, mediaeval, narrative, Overbeck, painting, Perrier, Preti, Tasso, Tempesta, van Poelenburgh. Bookmark the permalink.